Thanks for Crista Anderson and Angela Stockman for pointing this out to us. This is a part of our Transformational Learning series and is related to Feedback, Assessment, Student Support, and Reporting. 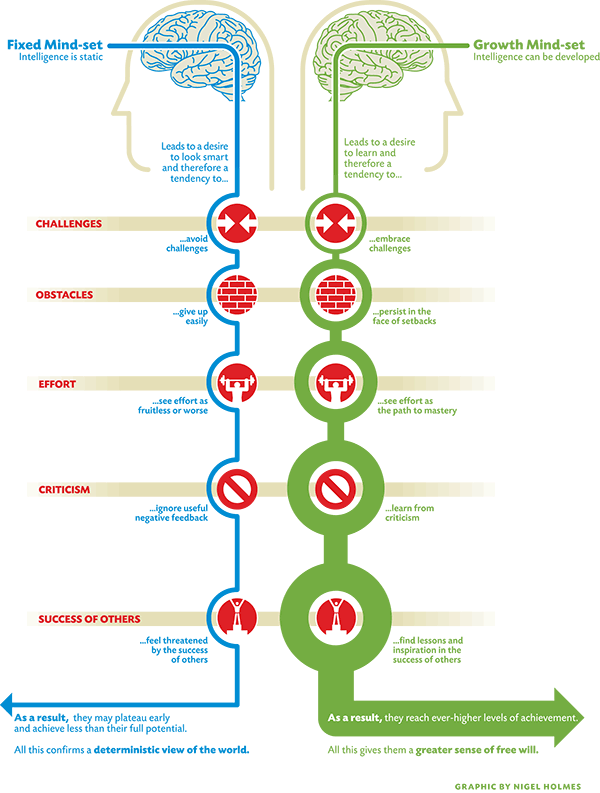 Mindset, the seminal book by Carol Dweck, a Stanford University psychologist, unpacks the difference between a fixed mindset and a growth mindset. In a fixed mindset, the belief is that intelligence is fixed and static. You are smart, or you aren’t. This was the widely accepted theory of cognitive development until a series of experiments in the 50’s and 60’s by UC Berkley professor, Mark Rosenzweig. His work with environmental influences on rats turned the idea of innate intelligence upside down. Below is an image that illustrates the (generalized) difference in behaviors between people of each mindset.